One black box from the crashed Lion Air jet has been recovered, the head of Indonesia's National Transportation Safety Committee said Thursday, which could be critical to establishing why the brand new plane fell out of the sky. 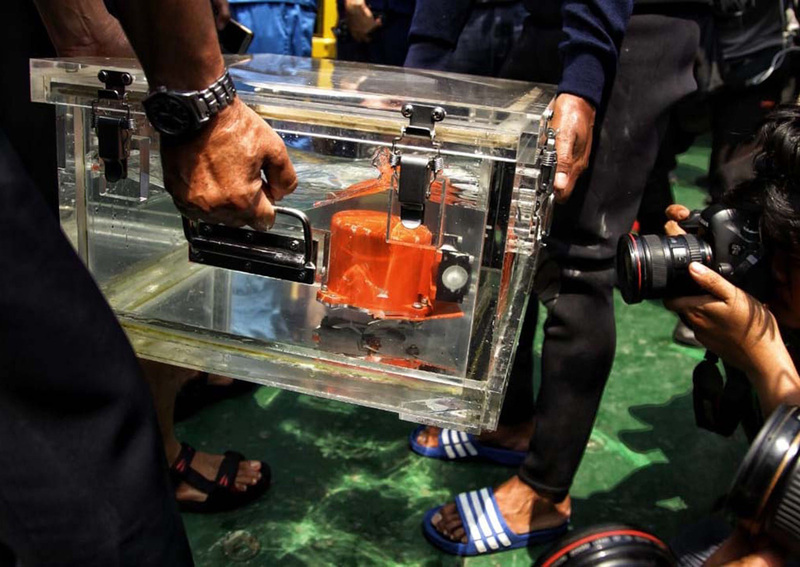 "We found one of the black boxes," Soerjanto Tjahjono told AFP. The Boeing-737 MAX 8, which went into service just a few months ago, plunged into the Java Sea off Indonesia's northern coast on Monday, killing 189 people, just 12 minutes after taking off from the capital Jakarta en route to Pangkal Pinang city. "Data from the plane -- the engine, all the instruments -- are recorded there," aviation analyst Dudi Sudibyo told AFP. Searchers are still looking for the plane's fuselage and only body parts have been found so far, possibly from passengers seated in parts of the jet that were decimated on impact. "I assume that there will be a lot of bodies still strapped into the seats," Sudibyo said. Authorities are sending recovered remains to hospital for DNA comparison to passengers' relatives. The 24-year-old's coffin arrived in her East Java hometown Sidoarjo Thursday, draped in a green and yellow cloth and inscribed with Arabic writing and carried through the neighbourhood by pallbearers. Dewi's mother collapsed and had to be carried into their home, while friends and relatives wiped away tears as the casket was laid in a freshly dug grave sprinkled with flowers, with a bowl of fruit and two palm branches at one end. Aviation experts are puzzled by the accident and say it's too early to determine what caused the crash. But Lion's admission that the aircraft had an unspecified technical issue on a previous flight -- as well its abrupt nosedive -- have raised questions about whether it had any faults specific to the newly released model, including a speed-and-altitude system malfunction.